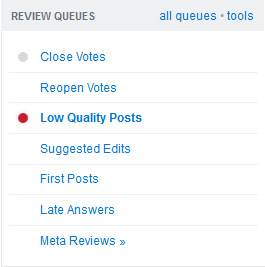 However the Low Quality Posts queue is empty. And before this, it had posts to review and still the red dot was visible, so it seems the queue doesn't affect this. Anyways, what does this red dot means? This is a known issue. The fact that the red dot appears means that there are actually still pending reviews to be completed. However, for some reasons, you can't get those review items. There are items in a queue which the user does not have the reputation to review. (I only know of this happening in the suggested edits queue, where tag wiki edits land in the same queue as post edits.) This once caused me some consternation. There is a single pending suggested edit, which is currently being reviewed by someone else and has been "checked out" to that reviewer. Does UX use syntax highlighting? Expiring bounties assigned automatically - what now?